Cook -Kaart van Van Diemens Land. Cook, J. - Kaart van Van Diemens Land. Kaart van Van Diemens Land. - Cook, J. Title : Kaart van Van Diemens Land.. Size : 8.5 x 13.6 inches. / 21.5 x 34.5 cm. Description :Captain James Cook (1728-79), explorer, circumnavigator and hydrographer. Three voyages, 1768-71, 1772-75 and 1776-79. From 1778 on printed editions of ' Captain Cook's Travels' appeared in English, Italian, French and Dutch.A map of the southernmost part of Tasmania. 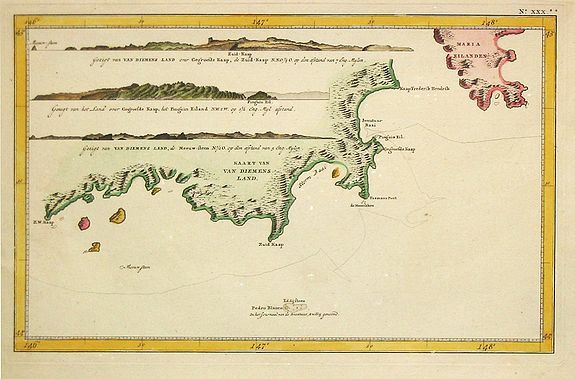 The coastline with various islands reaches from Cap S.O on the left side to Cap Frederick Henry. In the center is Cap Meridional. At the bottom center of the map is Pedro Blanco and Eddystone. A dotted line shows the route of Captain Cook. From a Dutch edition of Captain Cook's "Voyages".